The advent of streaming music services has been a godsend for anyone whose appetite for music exceeds the contents of their wallet. No longer are those obscure 12” Throbbing Gristle LPs doomed to spend their life in the dehumidified basement of Paul Morley. Instead, the likes of Spotify and Tidal act as a sort of benevolent cultural democratiser, dredging entire back catalogues to the surface and granting instant muso status to anyone with a spare tenner a month. But whilst the likes of Stereogum chew over the classics again and again, there’s whole swathes of digital flotsam that go largely ignored. These are the barnacles caught in the net, records that made their peace with the sea-bed long ago but now squirm uncomfortably in the glare of our retina-display screens. No one demonstrates this idea more than Ringo Starr. Here is a man who has quietly and consistently released one solo album every two-and-a-half years stretching all the way back to 1970. There’s 18 of them in total, and just looking at some of the titles throws up a dust-cloud of questions: Ringo Rama, Ringo’s Rotogravure, Time Takes Time, Ringo The 4th - What on earth do these records sound like? How is he outlasting virtually every other musician of his generation? Is he drunk on the studio riches that only an ex-Beatle could entertain, or is he rock music’s most overlooked^ auteur? For the sake of completists everywhere, Oeuvre Here dons its surgical gloves and plunges head-first into the abyss. With Ringo as our guide, we circumnavigate the back-catalogue of a man who long ago jettisoned the financial boundaries of the studio, a man for whom imagination is the only limit. Ladies and gentlemen we bring you, The Ringo Starr Discography. Listen along on YouTube, AppleMusic, Tidal, or Spotify. Ringo kicks off his solo career with twelve reheated standards from his childhood, each embellished by gilt-edged production courtesy of George Martin. Whilst the florid music flutters as if on a breeze, Ringo’s down-home accent plods along leaving muddy footprints everywhere. It’s a ticket to ride down memory lane, with Ringo as the conductor and his boyhood chums as passengers. As a result it’s a sentimental journey for one person only, and if you’ve not heard Ringo’s version of ‘Have I Told You Lately That I Love You?’ then you’re not really missing out. An inessential start, but one that sees Ringo venture forth into a journey all of his own. Things go full-on Liza Minelli with Ringo’s third album, a baton-twirling extravaganza that’s glossier than a dozen Vanity Fair centrefolds. At this point Ringo is still bathing in his post-Beatles glow, and he has enough cultural cache to convince seemingly every musician in his phone book to put in a guest appearance. This album contains contributions from both Harrison and Lennon, and was only beaten to the US Billboard top spot by Elton John’s Goodbye Yellow Brick Road. Ringo squirms uncomfortably in the middle of it all, singing numbers like ‘I’m The Greatest’ with all the conviction of your recently-singled uncle drowning his sorrows in the local karaoke dive-bar. The music really isn’t bad, but whether a man plucked out to narrate Thomas The Tank Engine is the best vocalist for the job is up for debate. In pasting his own face over Michael Rennie's face in this still from The Day The Earth Stood Still, Ringo effectively invents the culturally ubiquitous photoshop meme. Of course by now we’re learning not to read any symbolic meaning into Starr’s oeuvre; simply allow the absence of irony to wash over you in strong, rippling waves. Released in 1974, this album was the last to chart until 1998 and marks the beginning of the long descent into triple-figure sales and the sorts of ‘Strictly For Completists Only’ records that can only be unearthed via the miracle of YouTube. Lead single here is the infinitely covered ‘Only You’, which Ringo duly emotes in the style of a man forced to record an audiobook at gunpoint. Elsewhere the Lennon penned title track is pretty good, but pickings are getting slimmer and slimmer. We have to assume the title is for alliterative purposes only here. Searching for subtext within Ringo’s songcraft quickly becomes like searching for irony in a Dapper Laughs Vine compilation. At some point you have to assume that - like the extended cutaway sequences of the Brooklyn Bridge in The Room - Ringo is simply not interested in your version of coherence. This is, after all, Ringo’s Rotogravure. Get your own. It’s 1976 and Ringo still has some pretty big names on his speed-dial. He calls in favours from the likes of Eric Clapton and Harry Nilsson for some no-nonsense overdriven blues-tinged rock. Bonus points have to go to Ringo on single ‘Hey! Baby’ (you may remember the DJ Otzi version from the school playground circa 2002) who valiantly tries and fails hold note after note during the chorus. Anyone else would struggle to find a record label after this release, but the joy of Ringo is his ability to march onwards like a wound-up toy soldier. Keep on fighting the good fight Ringo! Now on his sixth solo outing, Ringo makes the bold move of jettisoning any help from his friends and releasing a disco album. A disco album! This is his first solo record that none of his three ex-bandmates contributed towards, and it sees Ringo climb aboard the booty-shaking bandwagon with all the grace of a rhinoceros mounting a swan. Alas, our boy Ringo is no Donna Summer, and this album was a critical and commercial disaster. It’s no wonder really, but their loss is our gain, and YouTube serves up an absolute treasure trove of unintentional comedy. Check out ‘Drowning In The Sea of Love’, which bubbles into life with synthesised stabs and a slinky funk bassline, before Ringo falls repeatedly on his face like a drunken man trying to climb down from a trampoline. By the time Ringo released Bad Boy, his solo career was in freefall. After the unmitigated disaster of Ringo The 4th, he decided to ease off on the disco influence and drive straight down the middle of the road with an album of increasingly tepid cover versions. There are no celebrity guest spots on this album, giving the impression of Ringo cut adrift a la Sandra Bullock in Gravity. Consequently It’s almost impossible to fathom anything less essential than this version of The Supremes classic 'Where Did Our Love Go?' That is, until you hear the wayward balladeering of title track ‘Bad Boy’, which was surely dredged from somewhere near the sea floor. At least when he was making disco it was funny, but this is so awkward you want to retrospectively stage an intervention. 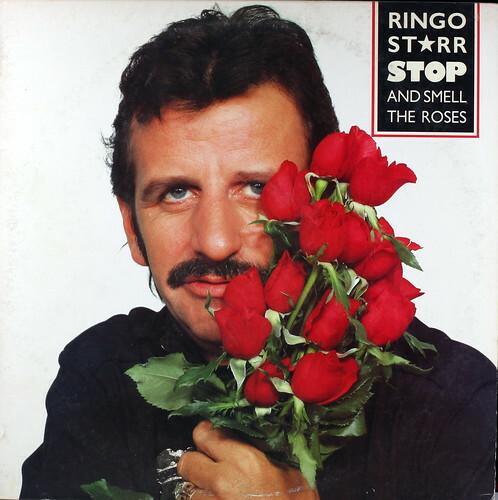 Whether or not this artwork was the genesis of the ‘creepy guy behind the bushes’ trope is up for debate, but that’s certainly an uncomfortable amount of roses obscuring Ringo’s face on this, his eighth solo album. This visual recession into the background is mirrored on record, with Ringo being aided in the studio by the production of McCartney as well as contributions from Ronnie Wood and George Harrison. The results are passable, if not essential. Well, obviously. I mean look at the cover. Perhaps this is Ringo nursing his wounds after a rocky few years where none of his last three albums charted. Perhaps Ringo now knows his niche and won’t fall victim to trend-chasing again. Perhaps, perhaps, perhaps. It's 1983 and whilst Duran Duran and Spandau Ballet rocket to the top of the charts, Ringo can't find a record company to release ninth album ‘Old Wave.' Poor Ringo. Swimming against the tide and being bludgeoned by the prevailing current... Maybe at this point someone should've escorted him from the studio and offered him a viable alternative. 'Ever played golf Ringo? Why don't you hit a few balls see if you like it?' But no, this is Ringo's ship and he's going down with it. The album itself - a refried stodge of village fete dad-rock - was so scorchingly off-brand that it was to be another nine years before Ringo resurfaced with his next release. Ringo’s gift for malapropisms and tautologies was well known in the Beatles heydey, and he returns with two corkers here. The album title makes you think long and hard about a whole bunch of stuff, whilst single ‘Don’t Go Where The Road Don’t Go’ makes for strangely compelling advice. This is all blues, balls and bluster, and marks somewhat of a return to form for Ringo, who emerges from his near-decade absence sounding refreshed and light-footed. It still didn’t chart though, which seems kinda odd, seeing as he roped in help from mates as showbiz as Brian Wilson and Electric Light Orchestra’s Jeff Lynne. Still, such is the way for Ringo, whose commitment to folly is now approaching levels that would make King Lear blush. 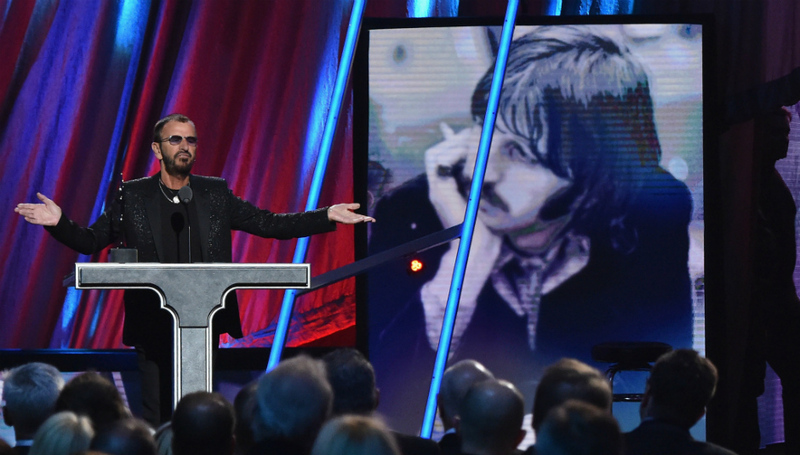 Ringo invites a cavalcade of stars to join him making his eleventh album, which sees his profile increase following the tremendous success of the Beatles Anthology series. The songs are a mellow and watered-down mixture of covers and original tracks with so many writing credits they’re practically crowdsourced. Recorded across six studios across two continents, this is the P&O cruise liner of Ringo Starr records. It probably cost as much to make as Live Aid raised, except this has far fewer memorable performances. One to seek out here is Ringo’s cheeseball version of ‘Love Me Do’, made to quell his disappointment at not being around to jam on the original 1962 version. If only John Lennon were available for comment. Oh look, a turn-of-the-millennium Ringo Starr LP called I Wanna Be Santa Claus with artwork that combines Fat Willy’s Surf Shack graphics with a colour scheme lifted straight from RL Stine’s Goosebumps series. Plus there’s Ringo disguised as The Grinch dressed as Santa Claus and inside there’s a whole bunch of Christmas standards sung by someone who - as we’ve learned - can demonstrably not sing. Not one to be deterred, Ringo ploughs ahead with numbers like ‘Rudolph The Red Nosed Reindeer’ and ‘The Little Drummer Boy.’ Go on. Here’s the link. I double dare you. Bored yet? Ringo isn’t. As surely as day follows night, Ringo returns with yet another pun / not-really-a-pun title and a sackful of guest appearances. He’s back on familiar ground here: just him, a guitar, drums, keys, backing singers, saxophone and more session musicians than the entire cast and crew of Game of Thrones. ‘I Think Therefore I Rock n Roll’ is one for the existential-heads out there, whilst the stilted phrasing on lead single 'Never Without You' is eerily evocative of the much-maligned ad campaign by Microsoft Songsmith . Does Ringo Starr know that these songs are being released into the wider public? Does he ever eat or drink? Does he ever go home? What will it take for him to ever stop? It’s 2005 and Ringo performs lead single ‘Choose Love’ on David Letterman. He’s flanked by an army of musicians, a horn section, backing singers and four elder-statesman session guitarists who’ve almost certainly spent their whole lives testing out different combinations of guitar pedals. 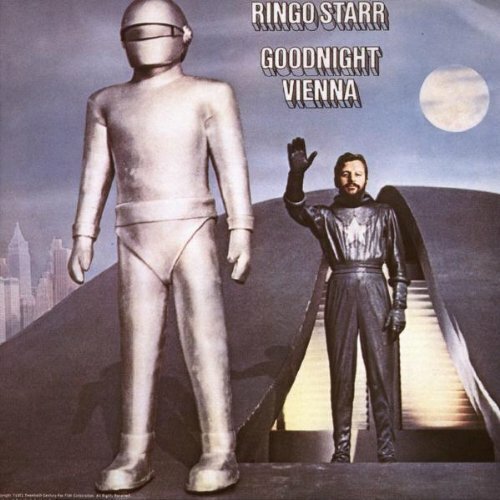 Ringo is nominally the Starr of the show, but if it wasn’t clear enough he’s the one in the middle of the stage creaking his body weight from side to side whilst wearing a tin foil suit jacket. The album continues in this vein, sounding like a free CD you’d get in a Korg Triton promotional magazine after popping to an out-of-town music shop. It’s professional in the same way that family portraits taken in a concession studio at Debenhams are professional. The only nod to rock n' roll here is Ringo’s strangulated Twist and Shout vocals, which sit uncomfortably in the show-home production that he favours in his late-period. Oh Ringo, you've come so far that turning back would be as tedious as continuing, to paraphrase Macbeth. Onwards we must. In the same year that Liverpool was awarded the European Capital of Culture, Ringo released his fifteenth solo album. It’s a collection of songs harking back to the good ol’ days of his childhood, a time where everything rhymed and cheesy guitar fills grew on trees. As ever his lyrics sound like a child making a police statement ‘Went to Hamburg / the red lights were on / with George and Paul / and my good friend John’ whilst the music is a strange combination of being elaborate and completely shapeless, like BT hold music replicated by an orchestra. At around the same time this record was released, Ringo appeared on The Jonathan Ross show, saying that he ‘missed nothing’ about his home city. The next day a topiary version of Ringo in the city was decapitated by vandals. Peace and love. “For decades musicians have been asking ‘Why’ but it took Ringo to ask - ‘Why not?’” says the plucky interviewer in this promotional video for Ringo’s sixteenth album. As we drift towards present day, Ringo becomes further entrenched in his own shrinking world of yes-men and handsomely-paid session dudes. The result is an album of songs that cast Ringo as the musical equivalent of the Japanese soldiers still fighting WWII in 1974. If there ever was a joke, Ringo is no longer in on it. He’s developed this inanimate relationship with time where he seemingly never learns or changes or develops. Instead he sings and bangs away happily for forty minutes or so, before making the peace sign and shambling off. There is no wider context to take into account any more, there is only Ringo. There will only ever be Ringo. With Howard Hughes-esque tenacity, Ringo’s seventeenth album was recorded in LA and went onto sell 752 copies in the UK. By this point it becomes clear that Ringo is your dad pottering around in the garden shed. Except the shed is a multi-million pound recording space and the results are available to stream on The Internet. There’s virtually no concession to an audience here, and the lyrics are a familiar walk through romantic Liverpudlian nostalgia and those twin tenets of Ringo’s personal philosophy, peace and love. Through it all, Ringo exudes the faded glamour of a former star, his star-shaped shadow growing lengthier in as twilight approaches. And so we arrive at the end-game, Ringo’s eighteenth solo album and perhaps his most placid trip down memory lane to date. The lead single is as cheap and cheerful as the eponymous seaside postcard, and one gets a sense that Ringo could happily bash out albums like this every other year for the rest of his life. All the songs here are co-written with his All Starr Band, and there’s a genteel cruise liner atmosphere that pervades through the click-track drums and dialled-in guitar solos. So there we have it. A journey of self-mythologisation from an artist whose meteoric fame could only ever serve as a platform from which to freefall. In 2015, Ringo occupies a bizarre space where he is both part of The Beatles and part of the grand folkloric carnival that surrounds their legacy. He is a one man testament to the idea of Ringo Starr, a man forever unfazed by the passage of time. Godspeed, Ringo. ^ = To be fair, he did just get inducted to the Rock & Roll Hall of Fame.